For other uses, see Simbad (disambiguation). SIMBAD (the Set of Identifications, Measurements and Bibliography for Astronomical Data) is an astronomical database of objects beyond the Solar System. 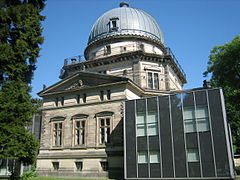 It is maintained by the Centre de données astronomiques de Strasbourg (CDS), France. SIMBAD was created by merging the Catalog of Stellar Identifications (CSI) and the Bibliographic Star Index as they existed at the Meudon Computer Centre until 1979, and then expanded by additional source data from other catalogues and the academic literature. The first on-line interactive version, known as Version 2, was made available in 1981. Version 3, developed in the C language and running on UNIX stations at the Strasbourg Observatory, was released in 1990. Fall of 2006 saw the release of Version 4 of the database, now stored in PostgreSQL, and the supporting software, now written entirely in Java. As of 10 February 2017, SIMBAD contains information for 9,099,070 objects under 24,529,080 different names, with 327,634 bibliographical references and 15,511,733 bibliographic citations. The minor planet 4692 SIMBAD was named in its honour. Planetary Data System (PDS) – NASA's database of information on SSSB, maintained by JPL and Caltech. NASA/IPAC Extragalactic Database (NED) – a database of information on objects outside the Milky Way, also maintained by JPL. ^ Schmadel, Lutz D. (2003). "(4692) Simbad". Dictionary of Minor Planet Names – (4692) SIMBAD. Springer Berlin Heidelberg. p. 404. doi:10.1007/978-3-540-29925-7_4607. ISBN 978-3-540-29925-7. ^ "NASA Exoplanet Archive". NASA Exoplanet Science Institute. Retrieved 12 July 2016.